Do you wait for the last minute like I do when it comes to decorating for holidays? We wanted a new American Flag Wreath for our front door this year. But, as usual I waited until the last minute. At least we still have our other patriotic wreaths! Actually July 4th snuck up on me this year. As I type this I can hear my neighbors doing “practice” firework runs. It’s either that or they just can’t wait a few days for the 4th! Don’t worry. 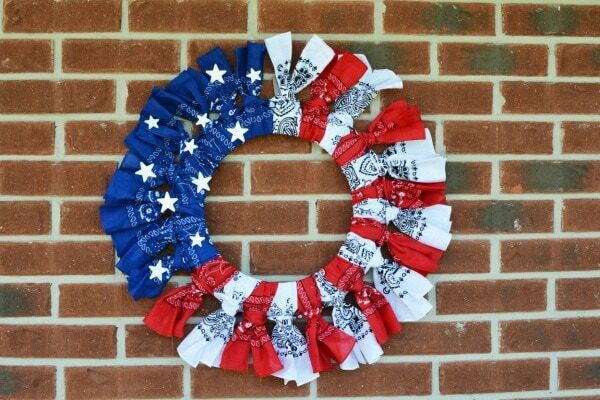 Even though we are already in July, this red, white, and blue bandanna wreath is so easy that it can be made well ahead of your Independence Day barbecue! Paint the stars with white acrylic paint and let dry completely. Follow with a second coat and let dry. The bandannas are folded in fourths, unfold and simply cut on the fold lines. There’s no need for it to be exact. Open up one bandanna piece. Fold into thirds bringing the ends to the center. Again, it does not have to be exact. Fold the entire piece in half so that you have a loop on one end. Make sure the opposite open ends are even. 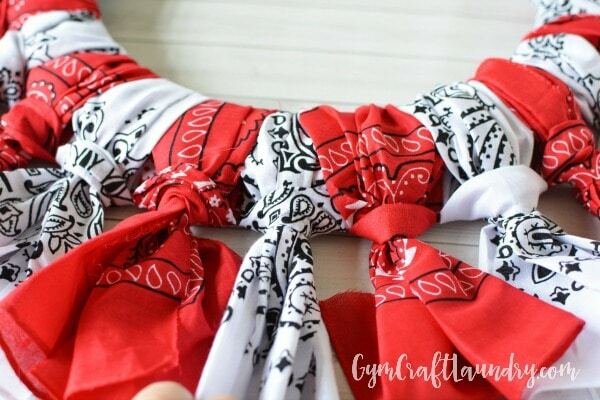 Flip over your wreath form and place the folded portion of the bandanna under the form. Bring the open ends through the loop and pull tightly “down” or toward the outside of the wreath form. 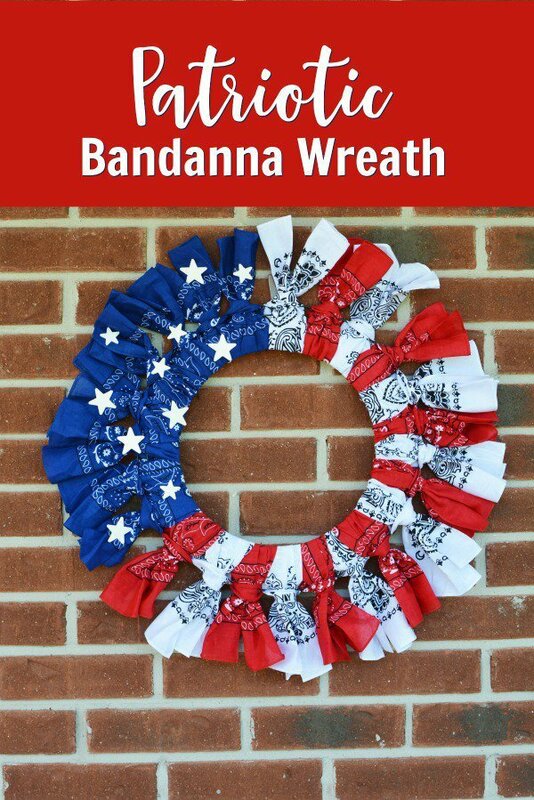 Continue making your wreath by placing 8 blue bandannas together, and alternating red and white to create stripes. 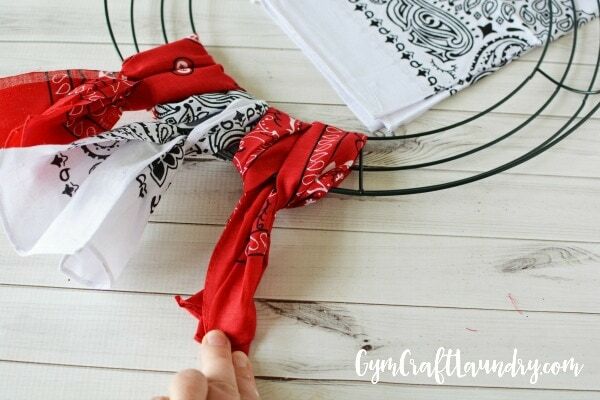 When finished, pull each bandanna tightly and separate the ends so it lays flat and open. 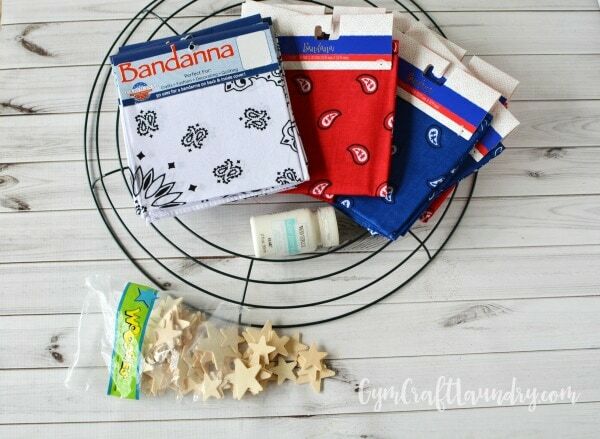 Attach the wood stars with hot glue. Are you decorating your home for July 4th? Do you keep your patriotic decor up through Labor Day? PS. If you don’t have time to make one there are cute patriotic ones on Etsy!